RF bodypack audio transmitters continue to grow in number, features, and functionality. Here is a selection of current models. The WTU-2 compact metal bodypack solution for the RE-2 system is automatically compatible with the Telex RSB-2 mute switch for football applications. It offers selectable RF output power and, with optional BH-200 charger, rechargeable-AA-battery operation. The unit is compatible with RSB-2 referee mute switch. 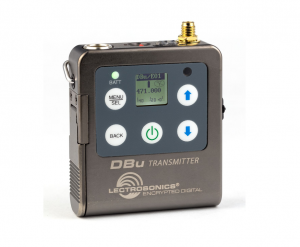 The DBu digital encrypted beltpack transmitter features AES 256-bit CTR encryption, wideband tuning (470-608 MHz for U.S., 470-614 MHz for export), a highly linear RF output stage for reduced intermodulation distortion, and true 50-mW transmission RF power for excellent range and resistance to dropouts. A multifunction switch can be configured for mute or power, making the unit flexible as well as providing 24-bit/48-kHz digital audio for pristine sound quality. 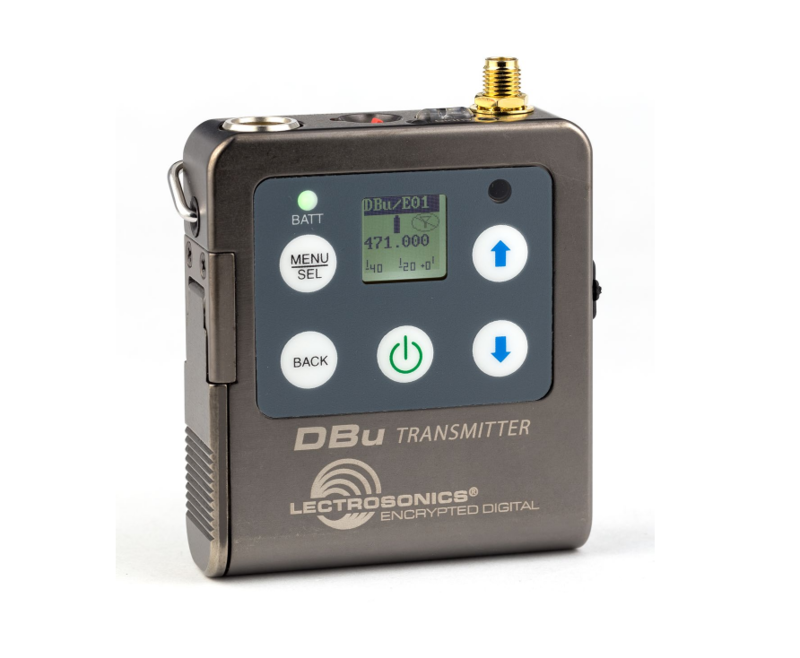 The SSM (Super Slight Micro) Digital Hybrid Wireless Micro transmitter tunes across 76.8 MHz or three standard Lectrosonics frequency blocks, features power settings at 25 mW or 50 mW RF power, and runs on a rechargeable lithium-ion battery. Dimensions are 2.52 x 1.48 x 0.57 in. ; weight is 2.3 oz., including battery. The SSM responds to RM remote commands compatible with the Lectro RM smartphone app. Frequency bands offered are A1 (470-537 MHz), B1 (537-614 MHz), C1 (614-691 MHz), and D1 (691-767 MHz, export only). The SMWB (single AA battery) and SMDWB (dual AA) transmitters tune across 76.8 MHz or three standard Lectrosonics frequency blocks and come in several frequency ranges. RF power for these models is selectable at 100, 50, or 25 mW. The SMWB and SMDWB feature the standard TA5 connector with servo-bias mic input also found on all previous SM Series units and all current TA5 beltpack units. The SMWB and SMDWB units can be configured as either transmitter or recorder, with files stored on microSD card in the industry-standard Broadcast Wave (.wav) format at 24 bits. The microSD memory card can also be used to update firmware in the field. The transmitters feature IR sync for quick setup and can also be configured via RM remote commands, compatible with the Lectro RM and PDR Remote smartphone apps, for hands-free setting changes. The new RefMicHD was implemented by the NHL in the 2018-19 season for on-referee audio. The model QT5100 transmitter has a large rocker-style mute switch physically integrated into the transmitter’s form factor. Previously, the NHL had been using the QT-256 transmitter with a separate on/off mute element. The RefMicHD combines all those functions into a single unit and underwent trials during regular-season games the previous season. The RefMicHD is compatible with receivers from Shure, Lectrosonics, and Wisycom as well as with Q5X receivers. 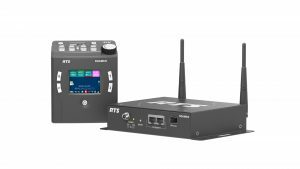 QT-5100 wideband remotely controlled transmitters are designed for sports applications and are frequency-agile from 470 to 700 MHz with 3,000 selectable channels across 75-MHz blocks in 25-kHz steps. Currently, there are five models of the QT-5100: Incognito, AquaMic (waterproof), RefMic (with integrated non-popping audio mute switch), PlayerMic, and PlayerMic S. The QT-5100 PlayerMic S, the smallest remote-controlled version to date, features a soft, tough, sweat-proof, flexible polymer enclosure; dimensions of 3 x 1.5 x 0.4 in. ; and a runtime of 3.5 hours at a 50 mW RF transmit power setting. The new ROAMEO is an easy-to-use communications system based on a wireless keypanel in the form of a beltpack. The system provides high-quality audio and caters to a large number of simultaneous users across a wide coverage area. Operating like a wireless keypanel, ROAMEO can be fully integrated into an existing ADAM series and allows users to address either individuals or specified groups. The system consists of the TR-1800 beltpack, the AP-1800 access point, and such accessories as a charger, holster, and pole-mount kit. Connection to a digital matrix is established via a single Ethernet cable. In addition, the system can use standard IT infrastructure, ensuring easy installation and low maintenance costs. Capacity can be increased by adding wireless beltpacks and associated access points. The new G4 series, part of Sennheiser evolution wireless portable systems, is fully compatible with all previous evolution wireless generations, safeguarding earlier investments. The EW 100-p G4 series comprises the EW 135-p G4 portable handheld set, two portable lavalier sets, the EW 112-p G4 (omni) and EW 122-p G4 (cardioid), and the EW 100 G4 ENG combo set, offering both plug-on and bodypack transmitters with an omnidirectional ME 2-II clip-on microphone. The Digital 6000 Series uses the same long-range mode and proprietary Sennheiser Digital Audio Codec as the Digital 9000, the company’s top-of-the-range wireless series. The digital two-channel receiver works across a switching bandwidth of 244 MHz (470-714 MHz), which is covered by three transmitter versions (470-558 MHz, 550-638 MHz, and 630-718 MHz). Up to eight receiver units can be daisy-chained without the need for an additional antenna splitter. System latency is 3 ms, and the Digital 6000 features switchable AES 256 encryption. 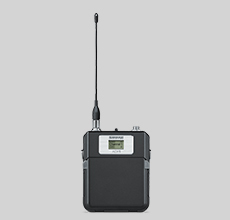 The SK 9000 is a high-resolution, uncompressed digital wireless beltpack transmitter, compatible with three-pin LEMO-connector lavaliere microphones. The user interface features an icon-based menu structure and infrared synchronization with the receivers, as well as exchangeable energy packs with lithium-ion batteries. The SK 9000 accommodates up to eight receiver channels.